Let’s make their lives flash before their eyes. From jaws to anaconda and most recently the meg, these movies have brought to life how scary the animals who live in waters can be. With large mouths and razor-sharp rows of teeth that can crush human bones, these animals are the true definition of worst nightmares. Now imagine been chased by such an animal, you would either fall off your kayak in fright or shock makes you immobile and you can’t swim to safety fast enough, thoughts of been gator food racing through your brain, the thought of the pain you will feel if the gator gets you and imminent death,I can guarantee you would take 10 years or more out of your life. Amazon.com describes it as’ Head decoy kit with reflective eyes for Canada geese and Blue heron control’, we know all that but tell me who can resist scaring the life out of their friends on a beautiful day made for enjoying the sun and serenity of a lake either swimming or kayaking, with a fake alligator head? Well, I know I can’t. Alligators are native to only America and China. They live in freshwater, wetlands, rivers, lakes, swamps, ponds and marshes. An adult alligator is usually black or dark olive-brown with white undersides. They have muscular, flat tails that propel them while swimming. They are also capable of short bursts of speed plus very short lunges. They wouldn’t ordinarily attack humans or see humans as prey but if they are provoked or in a bid to protect themselves, they would attack you. How to get your alligator head ready? The first thing you need is the Alligator head which you can buy here the remote-control alligator head at a great price. Next, you need to buy a remote-control boat small enough to fit into the gator head. You don’t want to buy a boat that would be a clumsy fit or one that would be too expensive. You would also need extra batteries as these batteries used to power and propel the head run out pretty fast. You wouldn’t want your gator just stuck in the water and not moving, wouldn’t be scary at all. Got some electrical tape? Yup, they are needed to make certain the remote-control boat stays snug in the gator head. Also, some glue, foam and the remote control which will be used to direct the alligator head as it moves. Once all these are ready, just open up the gator head, fix in the boat into the head, to make it snug; use the electrical tape and some foam to cover any spaces in the gator head till you get the right tight fit. Then secure it with some glue. Close up the gator head and you are good to go. Although, remember Amazon.com described the fake gatorhead ‘with reflective eyes? Yeah, that might give you away so you might just need to paint over the eyes with black paint, so it looks like a real live alligator. You would most importantly, need a video camera because what is a great prank if you don’t get to catch it on video to relive over and over again? Make sure your video camera batteries are fully charged to it doesn’t go off on you while shooting. So, you want to give your friends the scare of a lifetime or are you just a prankster? 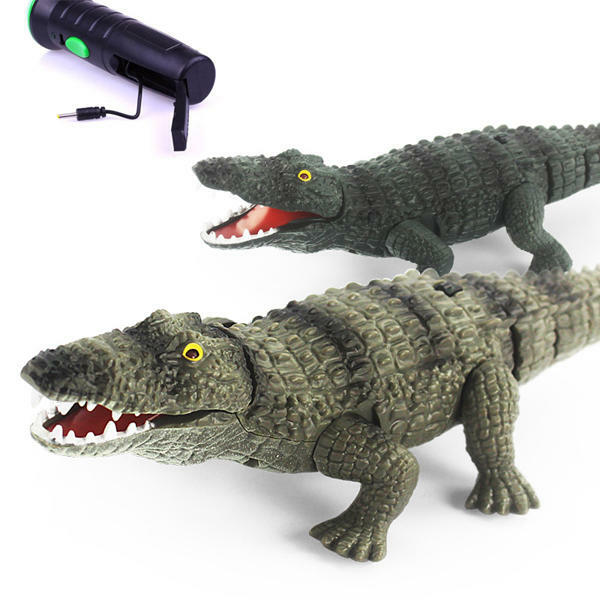 Are you having a family get away this weekend to the lakeside and want to have some memorable moments as your family scream in fear and run for the hills?Then the remote-controlled alligator head prank is just what you need as it is sure to be a great prank to play on anyone. Just remember, the cops might be called, and you would have some serious explaining to do although a prankster got away with it when the cops found out the gator was fake. Their response in quote was’ it’s pretty cool, that was a cool prank’. As for family, if you don’t want to be persona non grata at thanksgiving and Christmas, I would suggest you think twice before deciding to play this prank on your mom or dad, they might just take your name off the guest so fast it would make your head spin and then probably whoop you with the fake gator head for good measure. Well, buy here the remote-control alligator head and get right to it.